Sarah Brayer, a Rochester, New York, native based in Kyoto, Japan, who is internationally known for her large-scale poured washi paperworks and aquatint prints, is coming to Buffalo State on Tuesday, October 28. 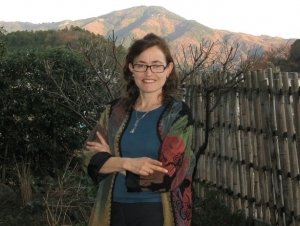 She will discuss “Painting in Japanese Paper: Contemporary Expression in an Ancient Tradition” at 12:15 p.m. in Upton Hall 230. Presented by the Margaret E. Bacon Visiting Artists Fund and the Japan Culture Center of Western New York Inc., her talk is free and open to the public. The Castellani Art Museum of Niagara University is featuring Brayer’s work through December 21 in the folk arts exhibition Between Two Worlds, which consists of both daylight and nighttime galleries devoted to her luminescent art. Additionally, Brayer’s art is included in collections at the British Museum, the Sackler Gallery of the Smithsonian Institution, and the American Embassy, Tokyo. In 2013, Japan’s Ministry of Culture awarded Sarah its Bunkacho Chokan Hyosho (“commissioner’s award”) for promotion of Japanese culture abroad through her creations in Echizen washi. In 2012, Brayer was invited to speak about her unique work in Japanese paper and light at a TED talk in Tokyo. Brayer’s Buffalo State visit is supported by a partnership among the School of Arts and Humanities, the departments of Art Education, Design, and Fine Arts, the International and Exchange Programs Office, the International Student Affairs Office, the Castellani Art Museum, the Buffalo Arts Studio, and the Buffalo Society of Artists. For more information, contact Carol Townsend, associate professor of design, at (716) 878-4986.